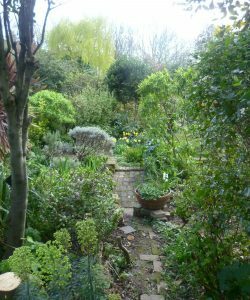 When I first knew the space which is now Culpeper Community Garden in London, it was an unloved bit of waste land, created thanks to the Luftwaffe dropping their left-over bombs on it after raids bombing the Kings’ Cross area. Rosebay willow herb grew there among the remains of bomb craters and bits of brick. 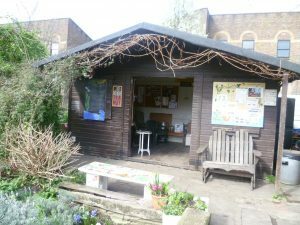 Nowadays, after a huge amount of hard work, it is a Community garden and it plays a number of roles. It’s a peaceful public space, with a picnic area and benches for when it’s fine, and a tea room with a patio where you can sit in the shade. It also has forty-four, irregularly-shaped plots, all gardened organically. Anyone who lives locally and who doesn’t have a garden can apply for a plot. (If you neglect it, you lose it – and there is a queue.) Some gardens are tended by local schools: I like the charming hand-made label hanging from a branch, telling you that this is a hazel tree and peacock butterflies like it. A new patch has just been taken over by a group of mothers who are home-educating their children. I talked to Fern and Vanessa; they’d only had their plot a couple of weeks (it was looking a bit unloved) and they told me that it’s going to be a garden for wild-life. I’m looking forward to seeing it in a couple of months’ time. There are also some raised beds for gardeners with disabilities, which is an excellent idea. The main paths around the garden are accessible to wheelchairs and there are plenty of benches. The pond: just now, it’s full of frog spawn. Note the statue of a heron standing guard in the pond. 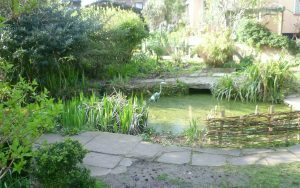 The pond, which is home to newts, tadpoles and frogs, has also attracted a heron and a couple of mallard. There is a notice board asking you to discourage them from seeing the pond as a free lunch stall. 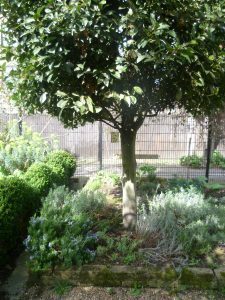 There are plots devoted to vegetables, a herb garden, just now very pretty with the rosemary in flower, a rose pergola, which smells wonderful in June, and plenty of public space. At the back is the business end of the garden with two compost areas, and a des. res. 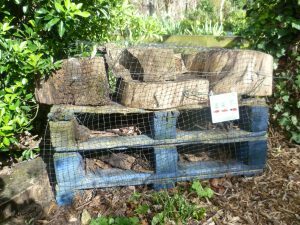 home for hibernating woodlice and other insects. The school-children have helpfully put up a notice illustrating which insects are welcome. 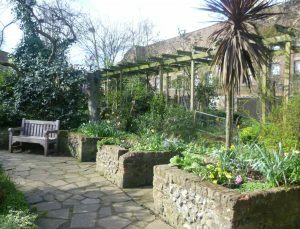 Various groups use Culpeper Garden regularly for functions, including the scouts; the Claremont Singers’ carol concert; an annual pensioners’ strawberry tea; and the Elfrida Society, which runs a weekly gardening group for people with learning difficulties. Culpeper Garden also has regular plant sales, with local gardeners donating plants in aid of the garden. 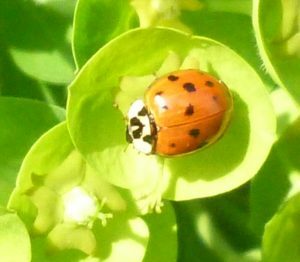 It’s a great idea; whatever plant you buy is obviously happy growing locally, and that means there’s a sporting chance that it will like your garden, too – and, of course, you are supporting a good cause. I visited it earlier this week and took a number of photographs. The gardening year is only just beginning and I can see that, in a few weeks’ time, there will be a whole lot more to see. But, whatever time of year, the Culpeper Community Garden always offers the visitor a peaceful and much-loved space in the middle of a busy city. Thank you for dropping by, Anne. I agree with you 100%. Culpeper Garden isn’t large but one doesn’t feel hemmed in. I think the feeling of space is helped by the plots being higgledy-piggledy and different shapes. Some are small and rectangular but most just follow the contours of the ground. Charming idea. Love that people take responsibility for a piece of the garden and create it. Wonderful for kids to grow things themselves. I agree, Elizabeth. And the variety in the forty or so small gardens is amazing. Someone is obviously seriously into topiary: I noticed three box would-be peacocks as part of a hedge surrounding one (very small) garden. Some have gone for colour; another for a tasteful herb garden. Some people prefer to help generally; it’s all very cheering. What a delightful place to visit! Your photographs and descriptions made me feel I really was visiting. How wonderful that it was a former bomb site (I’m old enough to remember bomb sites). Thanks for sharing. Thank you for dropping by, Anne, I’m glad you enjoyed the post. What I particularly love about Culpeper Community Garden, is that those who have plots are free to do what they want with them. 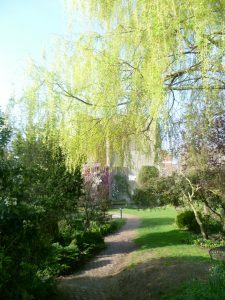 The original landscaping was obviously done professionally and with great care – the planting of the beautiful weeping willow, for example, the paths, the siting of the pond, etc. But, that apart, co-operation rules, not ‘officialdom’. 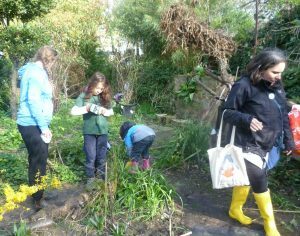 We’re no strangers to community gardens here in the urban bits of West Coast USA, but what you describe and picture above sets the example for us all to follow. Thank you for your kind words, Steve. I’m sure the Culpeper Community Garden organizer and her team will be delighted to hear it! 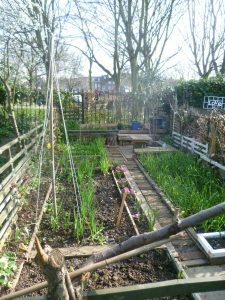 There are, of course, many different kinds of Community Gardens, each with its own rules and preferences. I’m sure it’s the same where you are. I think it’s all about using what you have to hand – in this case an old bomb site – and, here, creating something that everyone in a multi-cultural city can enjoy and feel at home in.